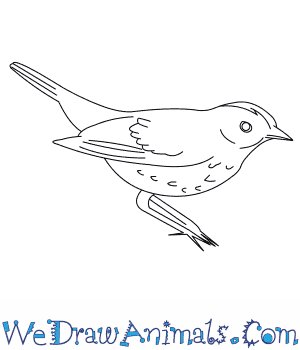 In this quick tutorial you'll learn how to draw an Ovenbird in 7 easy steps - great for kids and novice artists. 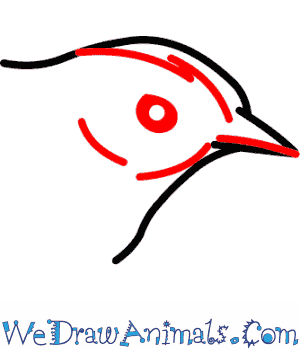 At the bottom you can read some interesting facts about the Ovenbird. 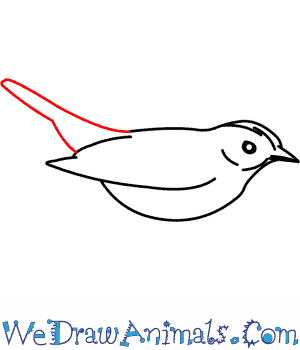 Step 1: The first step in drawing the ovenbird is the draw its head. 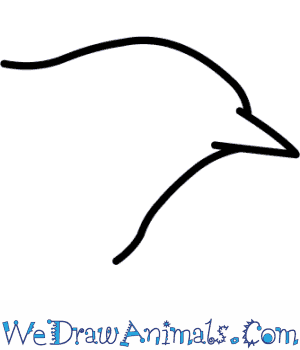 It has a round head but a sharp beak. Step 2: Next, is to draw the face. 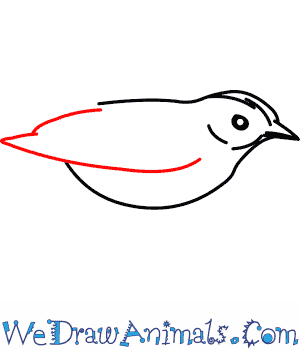 The ovenbird has a round eye and at the very top of its head has an orange area. Step 3: Then draw the body. 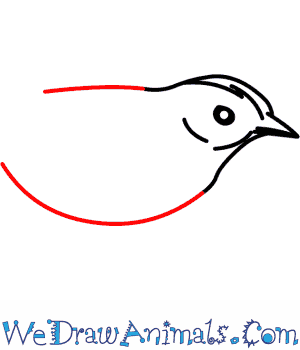 The ovenbird has a round belly but almost flat back. Step 4: The next step is to draw the wing. 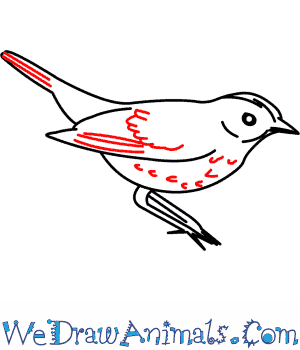 The ovenbird is a small bird so it doesn’t need big wings. Step 5: Next, draw the tail. The tail connects to remaining body of the bird. 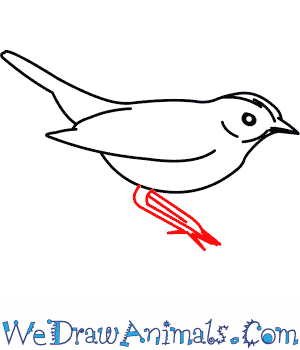 Step 6: Then draw the legs of the bird; it has a knee joint very close to the body of the bird. 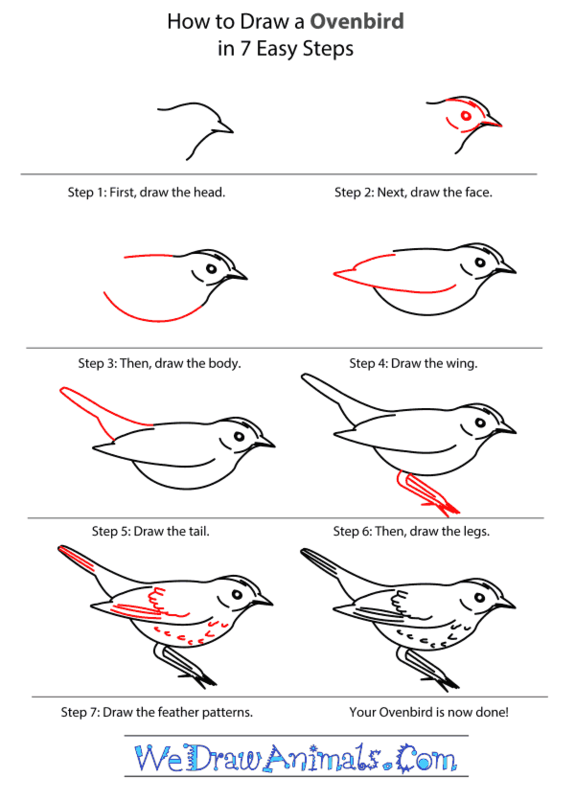 Step 7: The last step is to draw the feather patterns on the body. The ovenbird (Seiurus aurocapillus) is a small songbird. During the summer it can be found in North America, and it migrates to Central America in the winter months. They live mostly in forests, and prefer to look for food in areas with a lot of shrubs, avoiding wet or swamp-like places. These birds eat worms found on the forest floor and small insects that remain near the forest floor. The ovenbird’s nest, called an oven, is where they get their name from. It is a dome made from sticks and leaves, with a side entrance for the birds to enter. Due to the fact that ovenbirds build their nests on the ground, they are easily accessible to some predators. Chipmunks will sometimes burrow directly into the nest and eat the babies. The ovenbird is olive-brown, with black spots on its breast. Males and females look alike. Because of their size and coloring, the ovenbird is often mistaken for a thrush. Lesson plan note: Discuss why, although the ground can be a dangerous place for birds to build their nests because of predators, ovenbirds build their nests on the ground.